This is a review that I've been working up to for a couple of months. In that time, I've used up the entire volume of ink that this thing holds. It's got a fine nib, and that's a lot of use for me on a single pen. This is one of those pens that I just kept reaching for. 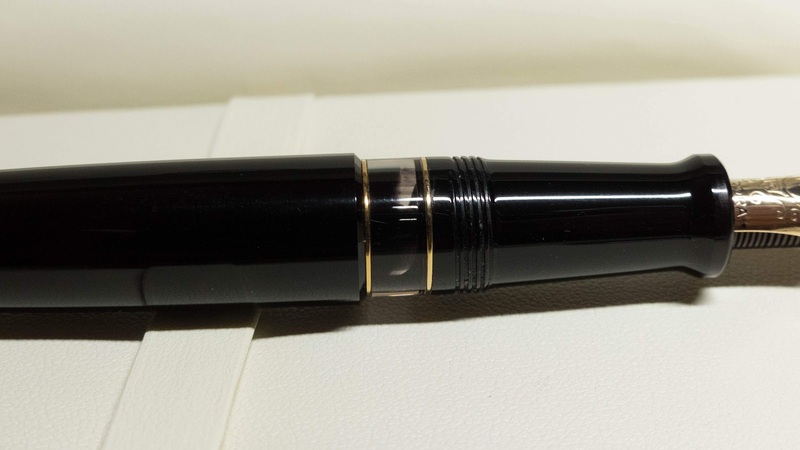 When Cary (from Kenro, these days) offered to send me this pen, I wasn't all that excited. 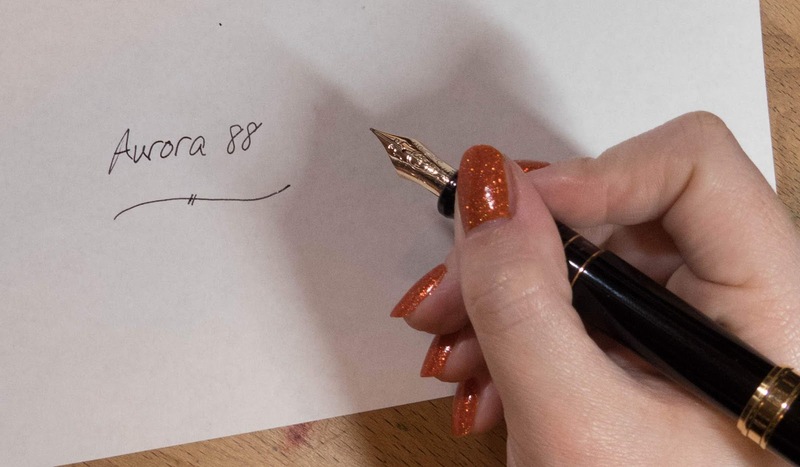 I didn't know much about the modern 88, and I'm not usually into black and gold pens. They're sorta subtle for me. Well, they used to be. Since I've gotten this pen, I've gotten two other black and gold pens. I guess I caught the bug. Read on, check out the pictures, and watch the video for more info and such. Filling System: Piston. A really nice piston. 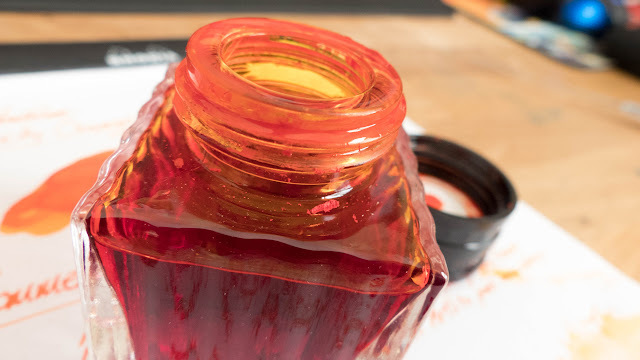 There's a really nice ink window that hides underneath the cap. It's a little hard to see in this picture due to the . The threads are small and unobtrusive. 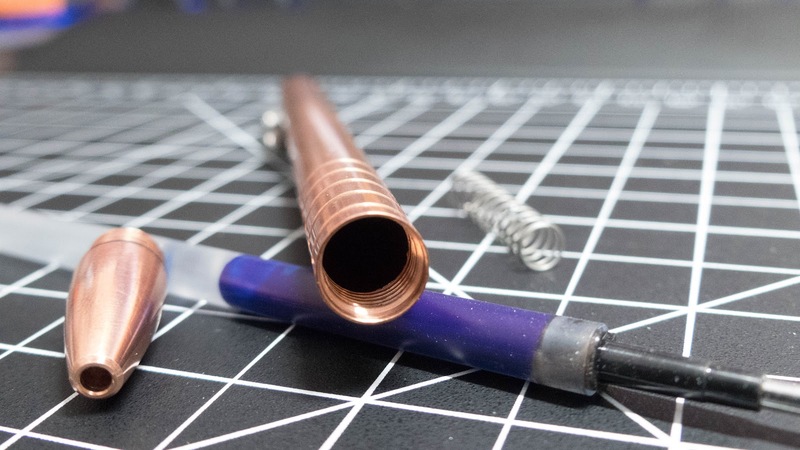 The section has a nice taper that changes about 1mm from top to bottom, and there's a great flare at the base of the section that is really comfortable to rest your fingers against. I've written pages at a time with this pen, and there's no strain. Notice the finger prints. You can't keep your prints off of this pen. 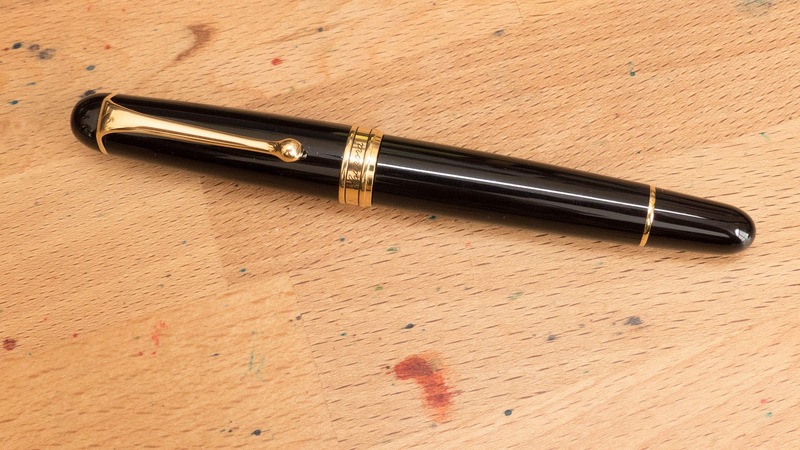 It's not a problem of this pen, but of all glossy black pens. I bet the matte version of this pen would solve this problem. The picture above shows the piston partially unscrewed. I wasn't really out of ink at this point, but it was getting close. The knob isn't loose, and the piston feels as good as any other piston I've ever used. You can see through the ink window in the pic above and below. 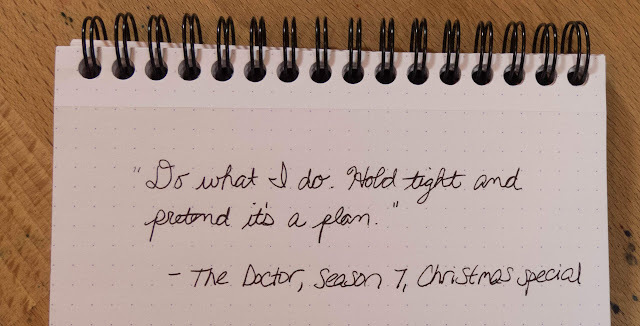 It's pretty much out of ink, now. A very useful window. Big and only a little bit off-clear. Slightly smoky, I'd say. 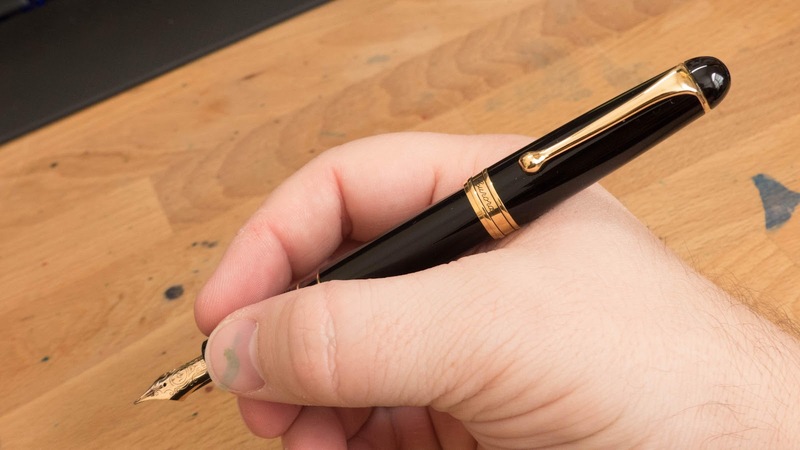 The nib size isn't anywhere on the nib, but you can find the size on the feed. It's a little hard to see, but you can make it out in the picture below. There's that curve on the side of the nib. I don't know why, but I really love that curve. Performance? Awesome. No skips. Hard like a nail, but smooth. Great. Audrey and I both hand-modeled this pen, and it's a good fit for both of us. She's clearly a better hand-model than I am. Is that the new Aurora Blue Black in the background? Yep. 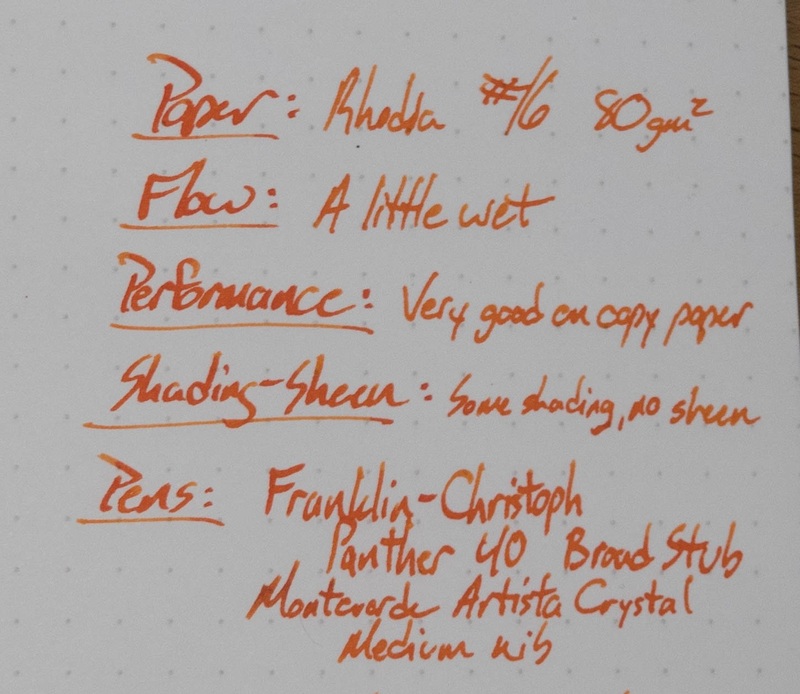 Pens: Tactile Turn Gist, Sailor ProGear, Aurora 88, TWSBI ECO, Lamy 2000, Sailor 1911L, Pilot Custom 74, Pelikan m1000. 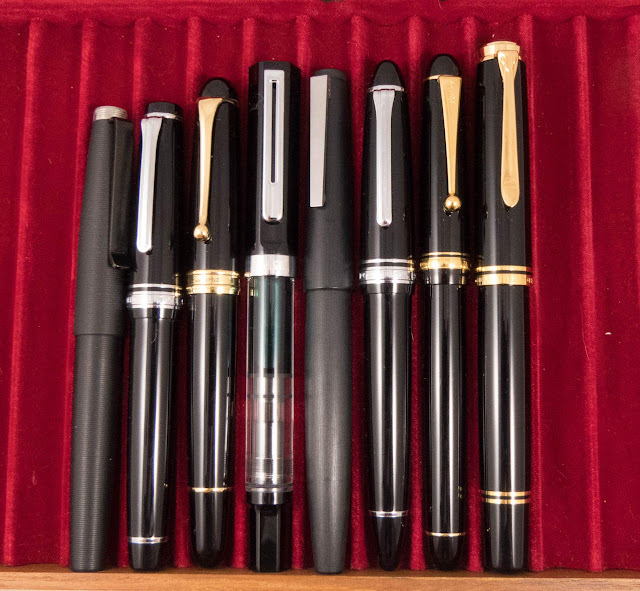 I've never had more trouble taking a picture of anything than a tray of glossy black pens. This pen is great. If you're looking for something wilder, you can check out their other patterns. There's a really swirly orange one if that's what you're into. 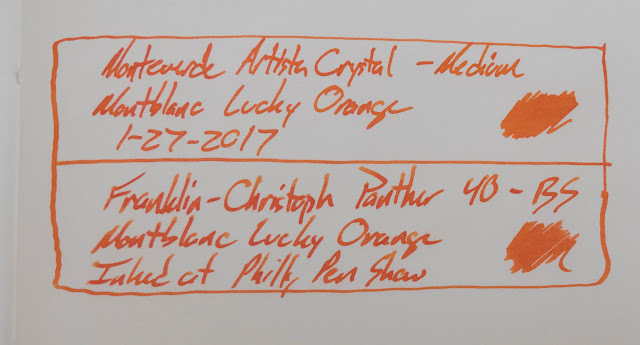 The only drawback to this pen is the price point. I wish it were way lower. Unfortunately, this sort of pen is going to command a pretty steep price. At this level, though, you're in upper-tier Pelikan territory. 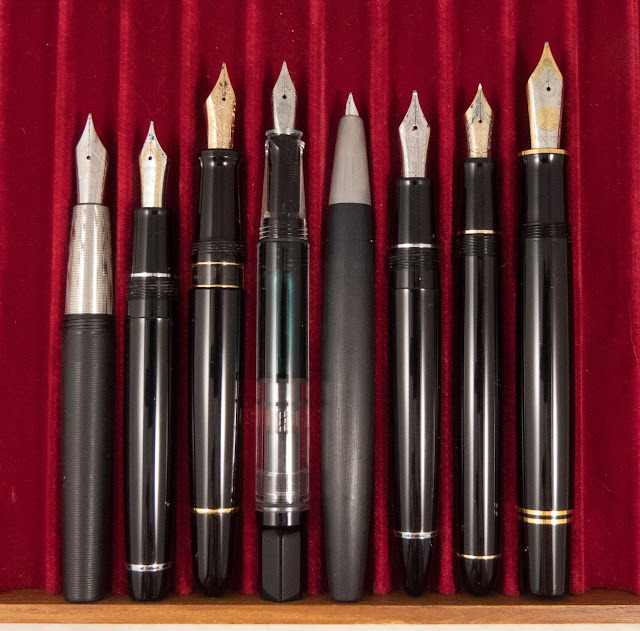 These aren't anything like Pelikans, though, so they're likely to appeal to very different audience. Anyway, check one of these out if you have any chance to do so. They're worth the time, and the price if it doesn't scare you off. I posted this Q&A video a couple of days ago, and totally forgot to post it here. Sorry about that! 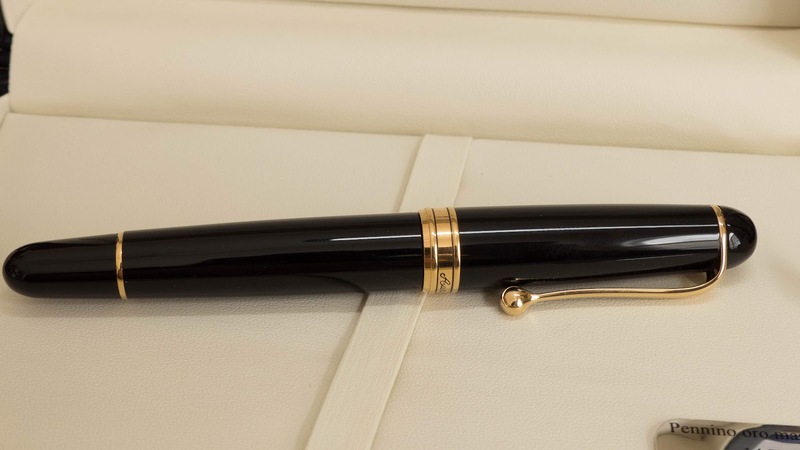 A Limited Edition Montblanc! And a good one, this time! 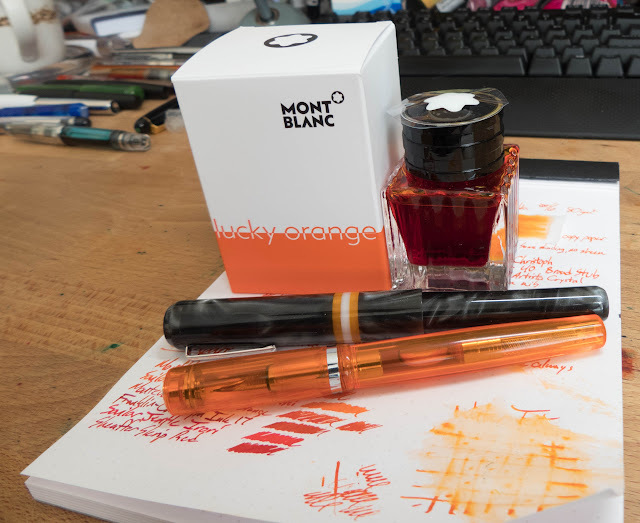 You know I love an orange ink, and this is the kind of orange that I love. Bright, saturated, and happy. The perfect thing to use in the dead of winter to cheer yourself up. 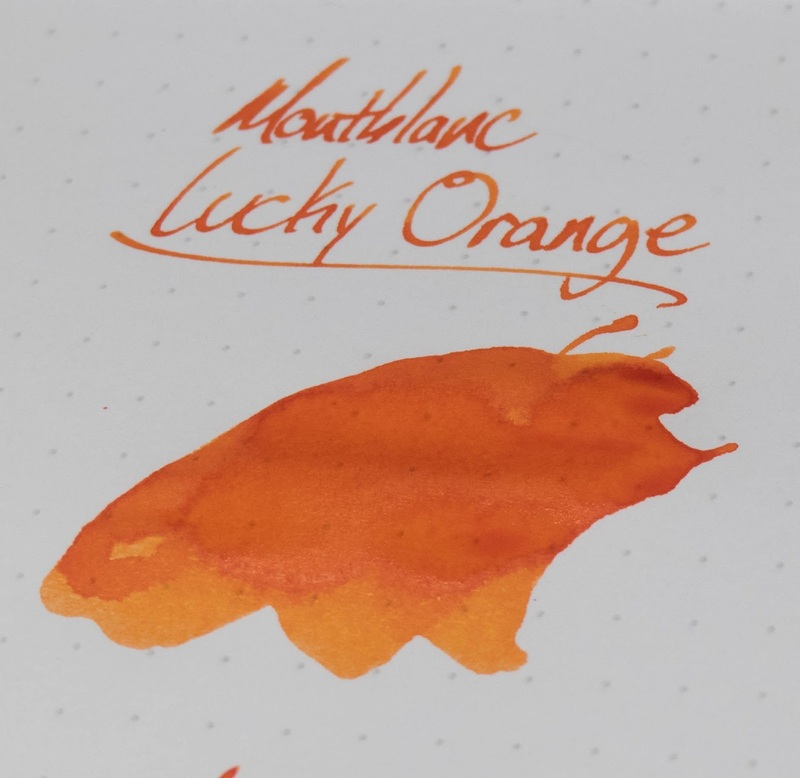 While the color on this one is awesome, it's not a perfect ink. 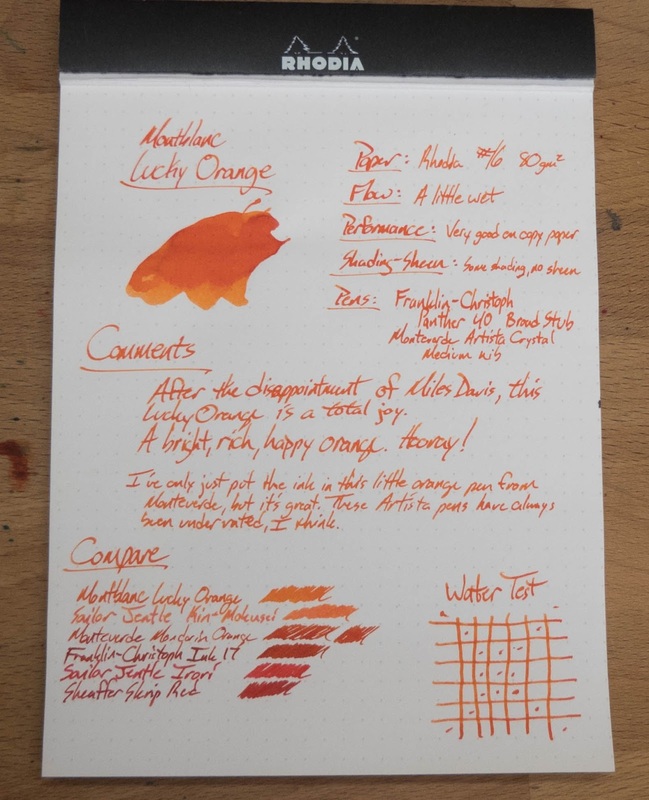 I had some issues with this one drying out in my nib when I didn't use the pen for a couple of days, and it was doing that in a Franklin-Christoph nib that never has that issue. Weird. 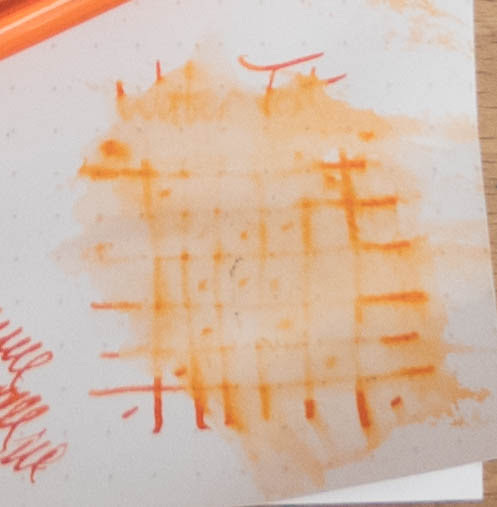 Once it gets going, the ink is fairly wet, but that drying-out issue is a problem. Check it out below, and grab a bottle before it's all gone. I wrote the whole top bit out, and then spelled "disappointment" incorrectly. So I left it. Call me lazy, but I wasn't writing it again. 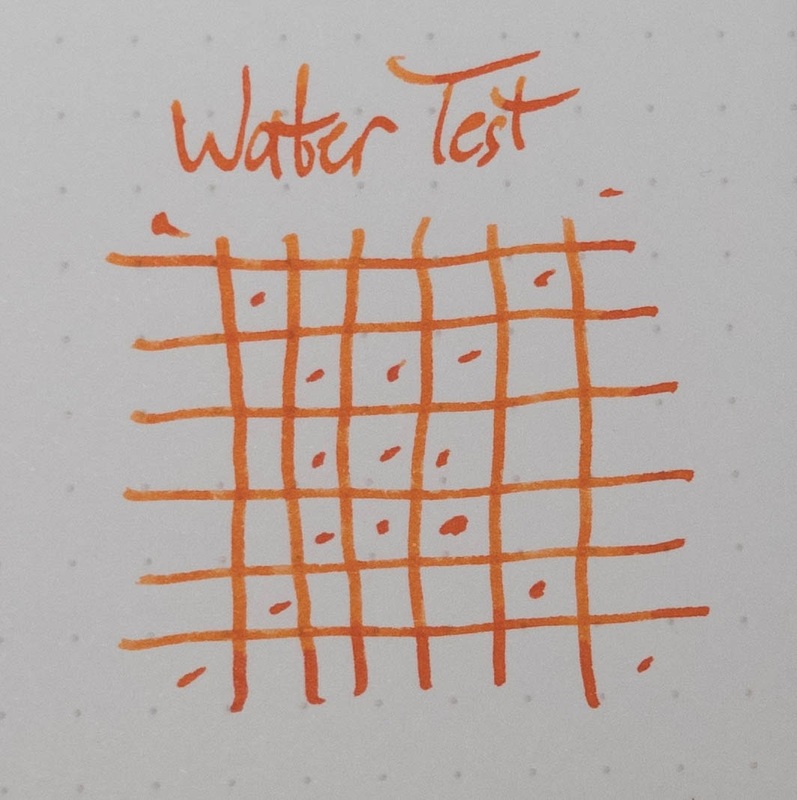 The ink is still wet in the pic above. 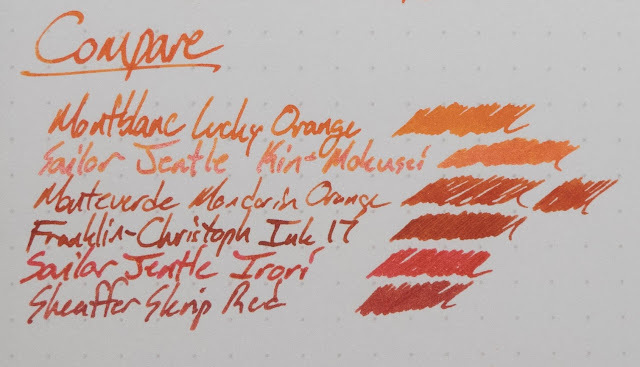 I like the way ink looks when it's wet. I bet you do, too. As you'll see below, this ink works really well on copy paper. That's a big point in its favor. Look at that! 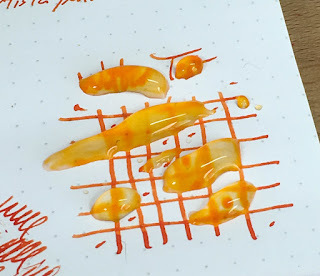 No bleed through, even with a broad stub nib. That's seriously good performance. Not quite as nice as it was on the Tomoe River, but still awesome. These LE bottles always come with a little hat. Gotta protect that snowflake. You can see some flaky precipitates around the threads in these pictures. It's just dried ink, and nothing to freak out about, but it does say to me that this ink might be just a little over-saturated. 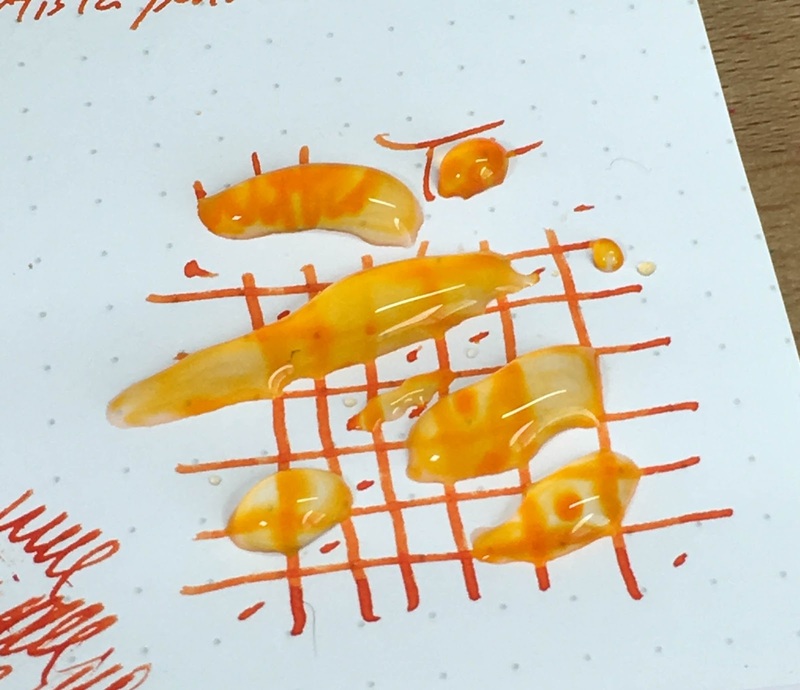 It looks awesome, but that is probably why it's drying out in my nib. 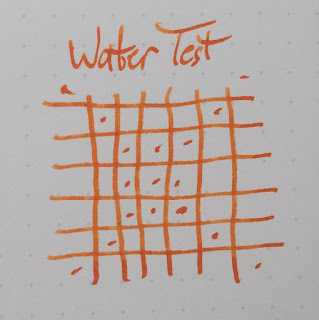 The orange doesn't stand up to water. It's kind of a mess after you clean the water off of it. 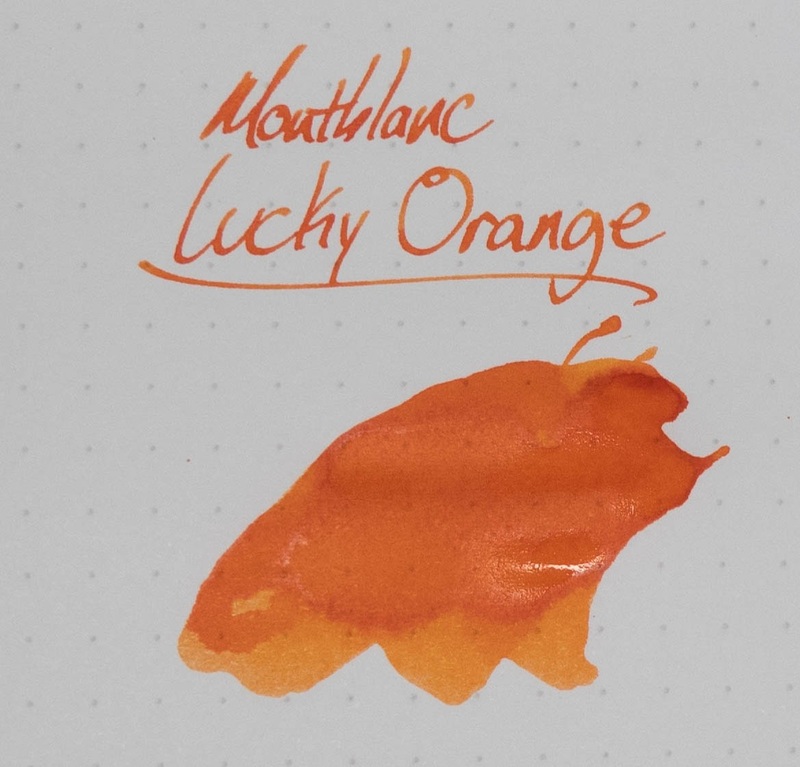 So, while not a perfect orange, it's a darn good one. You can find it at your favorite Montblanc retailer, and my favorite Montblanc retailer is Anderson Pens where I bought this ink for $19. 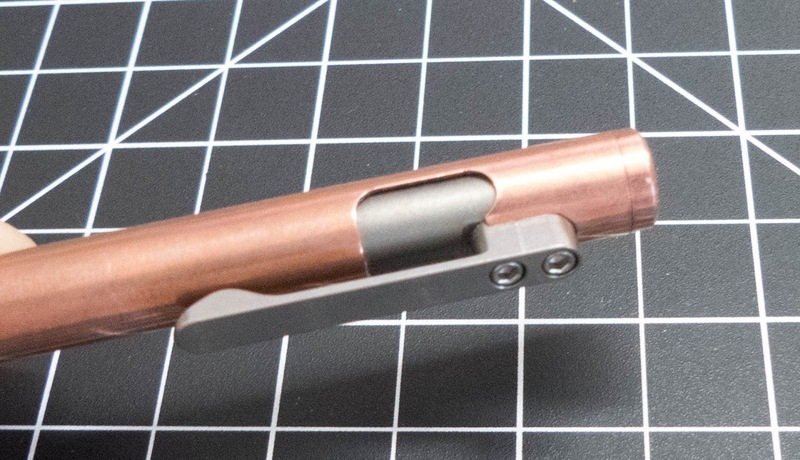 I've done a few reviews of Urban Survival Gear's TiScribe products, and they just seem to be getting better and better. 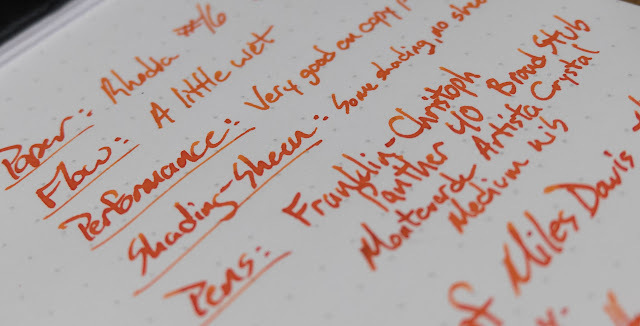 The first pen was a little pocket-sized fountain pen that I reviewed back August 2015. It was a pretty good little pen. Second was a really interesting project: The TiScribe HL. 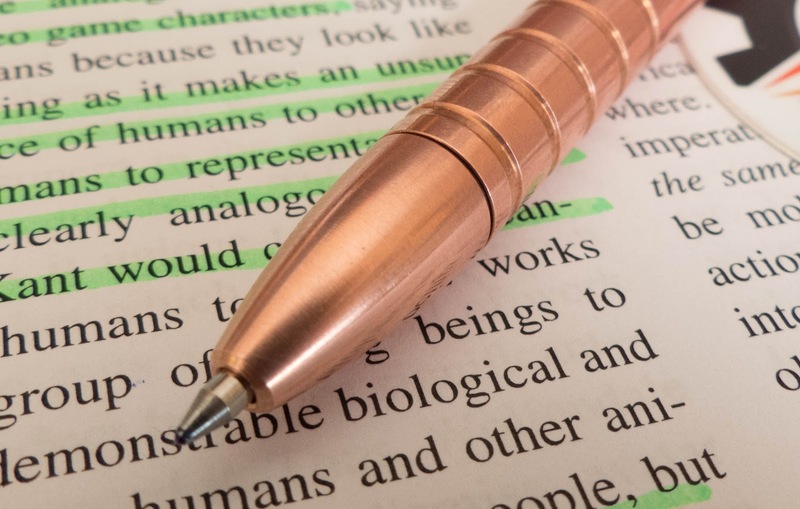 You don't really see machined highlighters, and this one is really cool. Now, we've got a bolt-action-style gel pen. 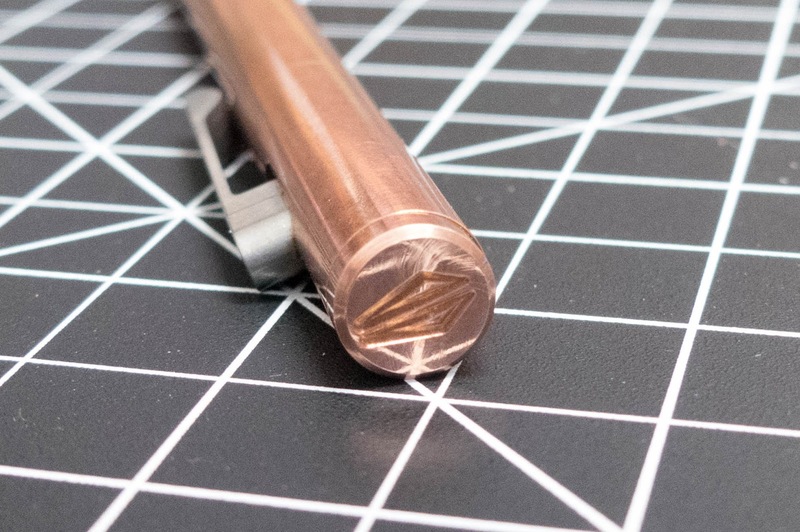 This TiScribe Bolt is a solid copper pen (just like the others), though it's also available in brass and titanium. 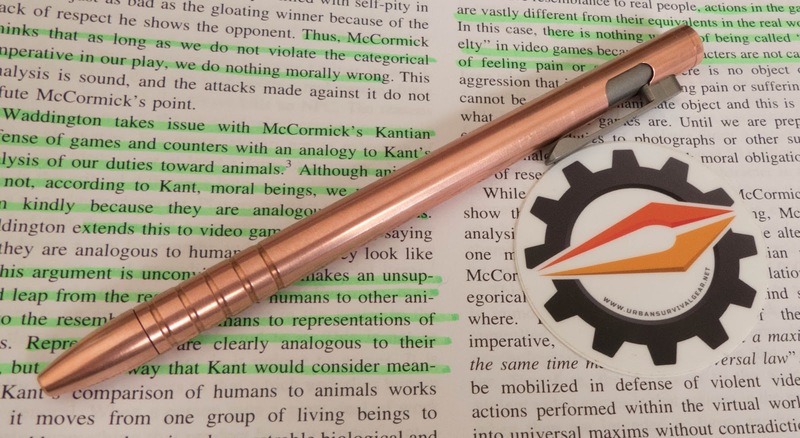 Thanks for sending this pen out, Kelvin! 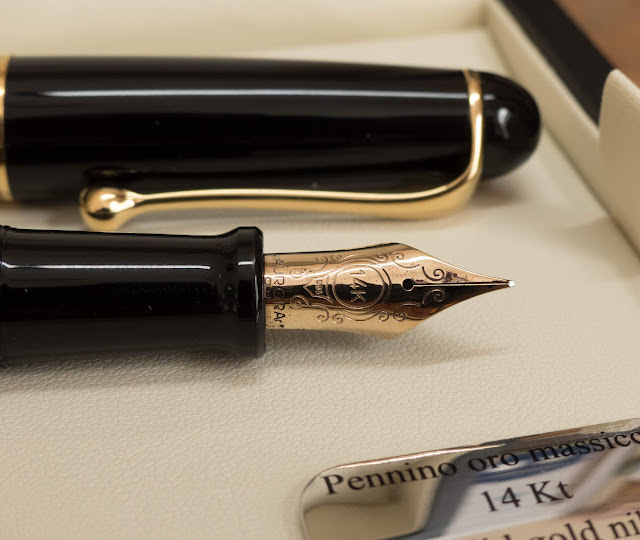 You can also get extra tips and finials that can change up the look of your pen. 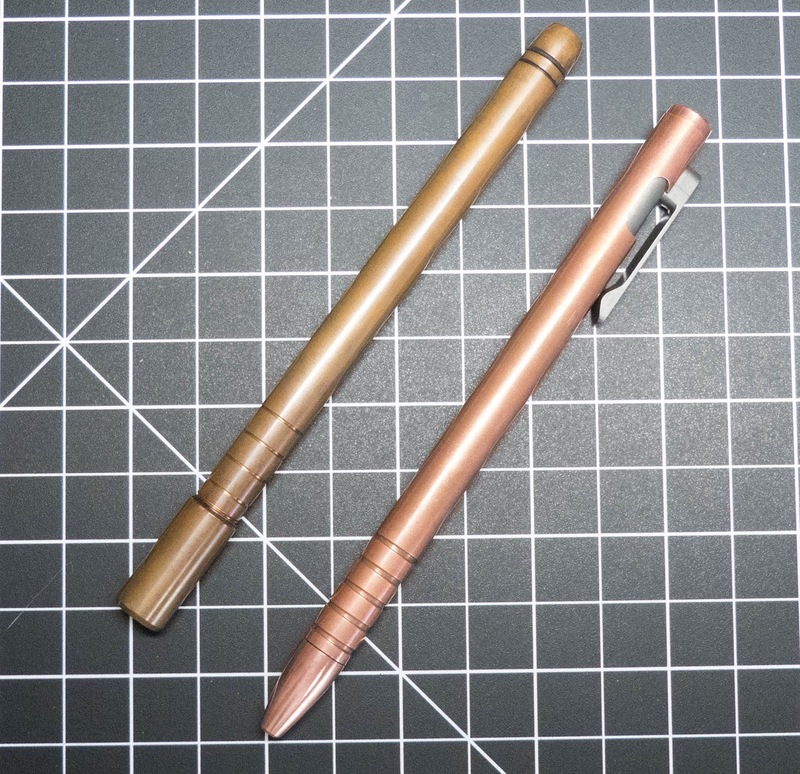 Tastes vary, but I really like the Ti pen with copper ends. It's a really cool look. This image is from the kickstarter page. It's pretty tough to stop doing that, actually. 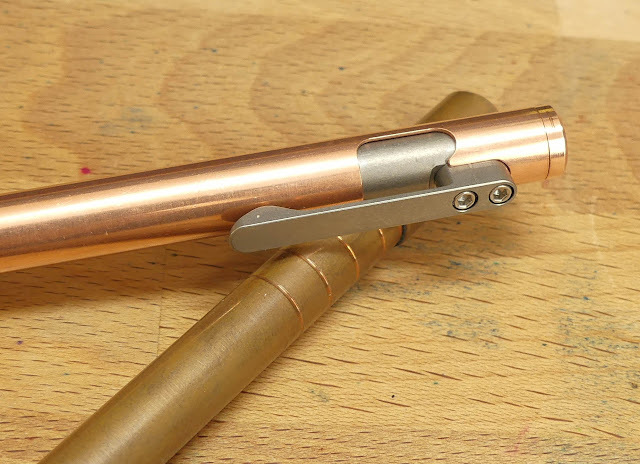 The bolt action on this pen is so smooth that you might have a hard time not-messing with it. It also doesn't make much noise, so that'll be a little gift to your coworkers. So, this is what the pen looked like when it was brand new out of the packaging. It was so shiny that I had a little trouble balancing the brightness for photography. Like a new penny! The clip and carrier in this pen is made from titanium, regardless of the metal of the pen. It looks good against the copper of this pen, and I bet it looks good against the brass, too. 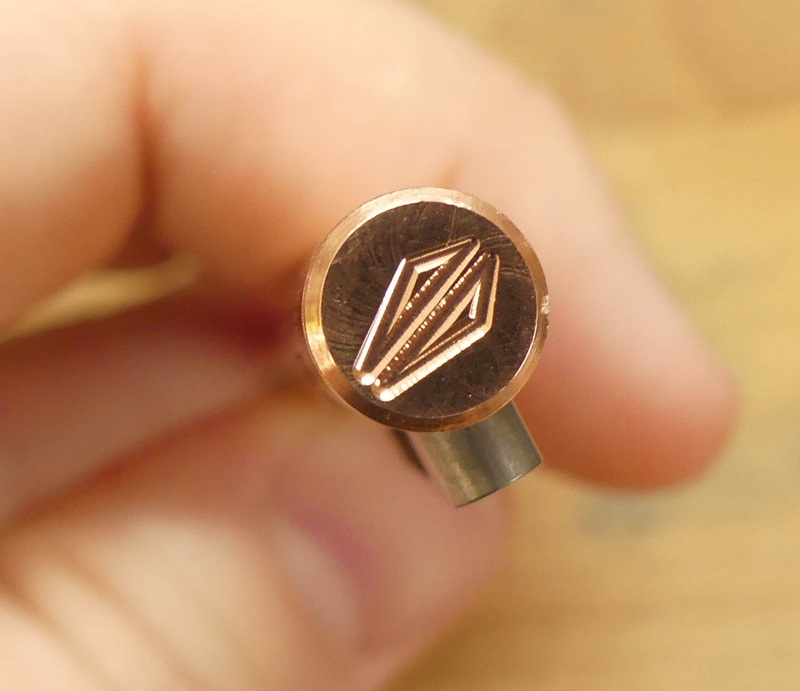 This is the emblem that's engraved in the finial, and it's the only bit of branding on the pen. I like that minimalism. I took pages and pages of notes with this pen, and it's starting to tarnish a bit. I tend to leave the tarnish on the metal, but this one might get a polishing. I really like the look of this pen. 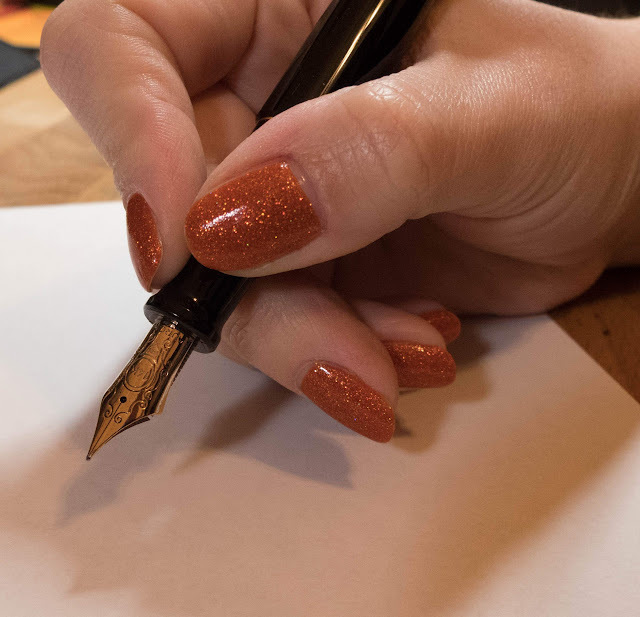 These ridges are comfortable and secure in your hand, so it doesn't slip even though it's an all-metal pen. 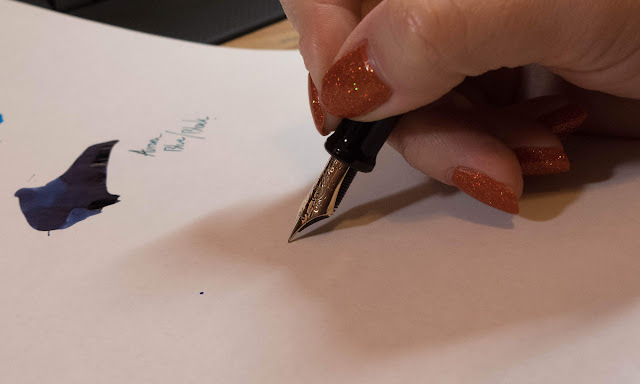 The fit and finish on the TiScribe Bolt is really on point. 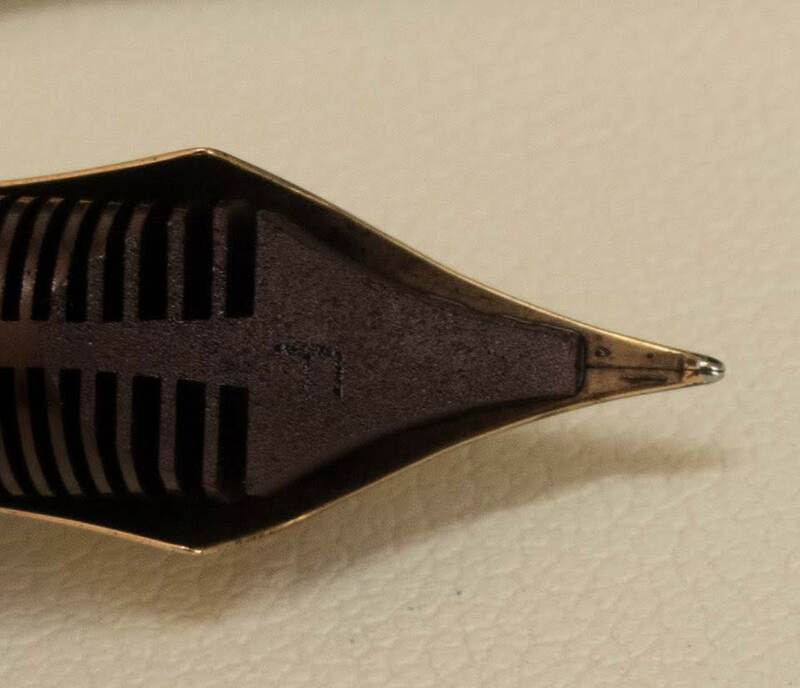 As you can see in the photo above, there's very little gap between the edge of the pen and the tip of the cartridge. So little that there's no tip rattle at all. I hate tip rattle, so that's a great feature. The only place that isn't touched is the finial, which is still bright and shiny. 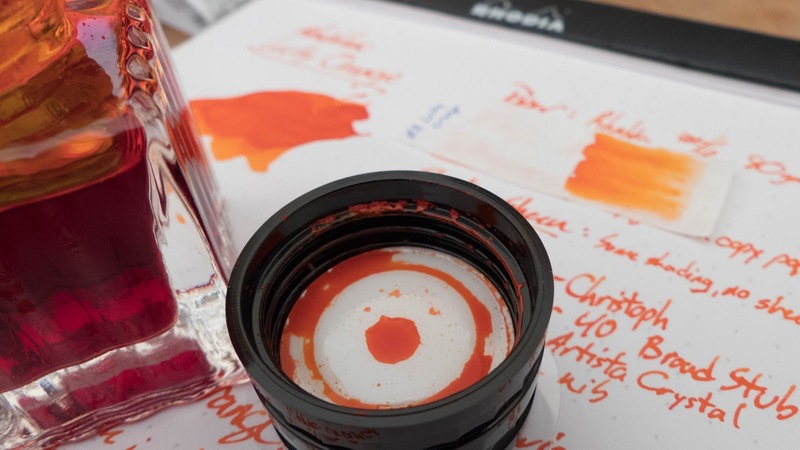 These pens are designed to use a gel refill, like the Pilot G2, though you can get a conversion kit which will allow you to use Parker-style refills if that's your preference. 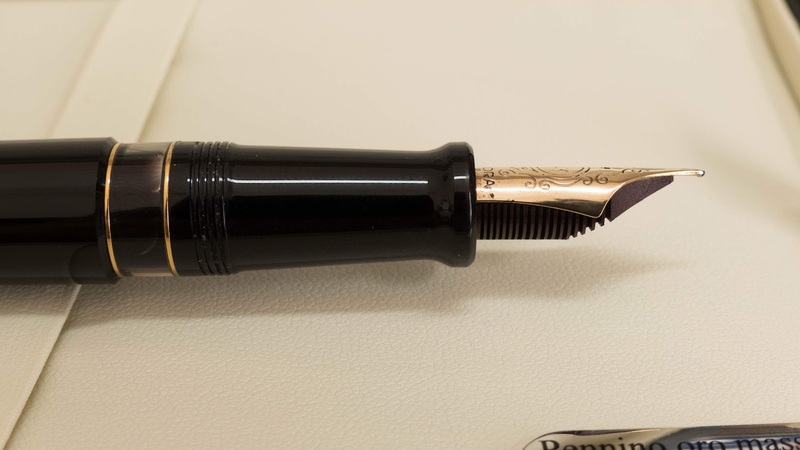 I replaced the G2 that came with the pen with this Signo 307 refill. 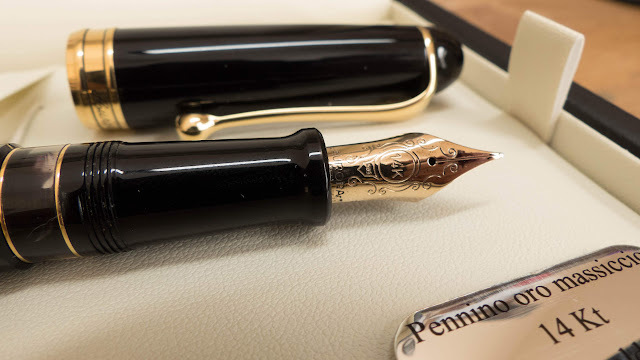 There aren't many pieces to this pen. Body, refill, spring, and tip. That's about it. It appears that you can remove the finial, but I haven't tried to do that yet. Check this pen out. If you like the bolt-style pens, then this one is an excellent version of the type. If you're into the EDC style, then check out this pen. It's bomb-proof. 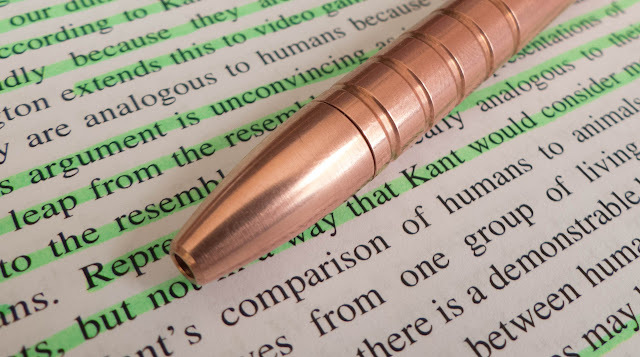 If you like pens that look like bullets, then check out this pen. It looks like a big bullet. See? 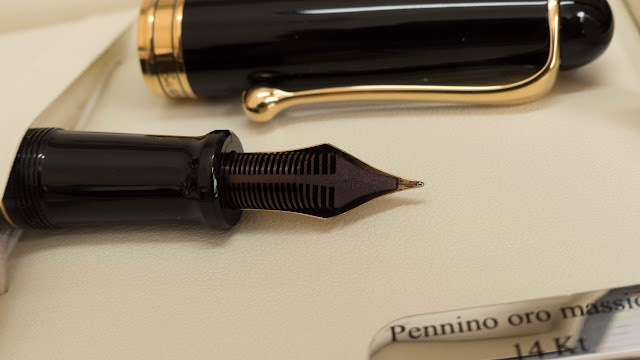 Plenty of reasons to use a non-fountain pen.